There's nothing like cruising on the open road, and nothing worse than windshield damage to your car from flying objects that get tossed at you while you're taking a drive. Don't let that small crack on your windshield spread, or the large crack on your window make your driving experience uncomfortable. Bring your car to the experts in windshield and auto glass repair. Discount Windshield Glass is an all-in-one auto maintenance center that specializes in windshield replacement and repairing auto glass components for cars, trucks, vans, SUVs, and just about any other vehicle on the market. Backed by more than 15 years of hands-on experience in the windshield repair industry, we always know the quickest and most efficient way to repair glass damage of any severity. 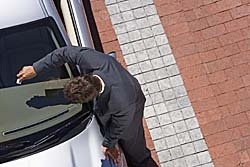 We repair door glass, auto glass chips & more! Established in 1995, Discount Auto Glass is a small, family-owned-and-operated shop that specializes in providing personal glass repair services. Since we are such a small shop, we are always able to provide you with the personal, one-on-one services you deserve. Our repair crew is highly skilled in repairing auto glass chips, cracks, leaks, and scratches in your low price windshield or windshield molding. We can also repair door glass. All glass repairs come with a lifetime warranty to ensure maximum protection for years to come. We will gladly replace and repair door glass and window regulators for vehicles of every make and model. Choose from an extensive assortment of new and used glass components, with specially made tinted windows available as well. Our shop is fully stocked with an extensive assortment of OEM and aftermarket windshields and glass components. Each new windshield we install comes with a lifetime warranty that covers leaks, wind damage, storm damage, and minor accident damage. No matter what type of vehicle you own, we always have the perfect windshield for you. Every repair and replacement service we offer comes with a full lifetime warranty to ensure maximum protection for years to come.